Today is a fantastic day. Do you know why? It’s a Pie Party! A few food bloggers were chatting on twitter and somehow this happened. Pretty awesome, right? I went all-American this time around, for Independence day. Peaches & blueberries. Perfect for enjoying while watching fireworks. Preheat oven to 400 degrees. On a lightly floured surface, roll one disc of dough into a 12-inch round, 1/8-inch thick. Fit into a 9-inch pie plate. Set aside in the refrigerator. In a large bowl, combine peaches, blueberries, sugar, flour, and lemon juice, toss to combine. Pour into pie plate, mounding in the center. Roll second disc of dough into a 12-inch round, 1/8 inch thick. Wet edges of the crust in the plate, then lay dough on top, pressing at edges to seal. Cut vents into top crust. Place in refrigerator for 30 minutes. Remove pie from refrigerator. Brush crust with egg wash, then sprinkle with sugar. Place on a parchment paper lined baking sheet. Bake at 400 for 20 minutes, until crust is browned at edges. Turn oven down to 350, bake for another 40-50 minutes. Yum... *drooling*... I want to go make this now! This looks seriously out of this world delicious! Fabulous photos! The peaches look luscious bursting out the sides, Hannah. I am forever jealous of the peaches you're able to get in the South. I don't make pie often enough. This looks like summery perfection! oh you cutie. pie is so good isn't it and so summery! invite me next time please. this particular pie looks dreamy. you are amazing. Isn't pie just the best! Your blueberry-peach looks so good! Ahh I don't think anything beats homemade pie, even if it is falling apart a little. :) And mmm peaches and blueberries! I have both in the kitchen right now, and I think your pictures just convinced me as to what I'm making next. girl, despite your misgivings, that is one pretty pie! i LOVE a lattice topped pie. plus, you cannot go wrong with the combo of peaches and blueberries. What a delicious combination. 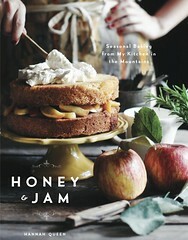 I can't wait to make this! Thanks for the recipe and lovely photos. mmmmm.... that sounds delicious! 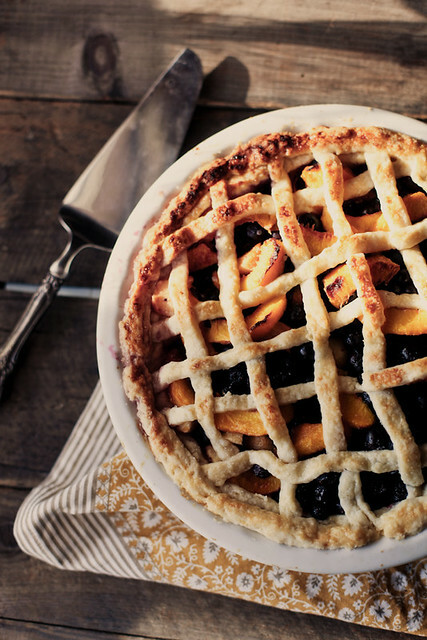 Blueberries + peaches + lattice crust = die. 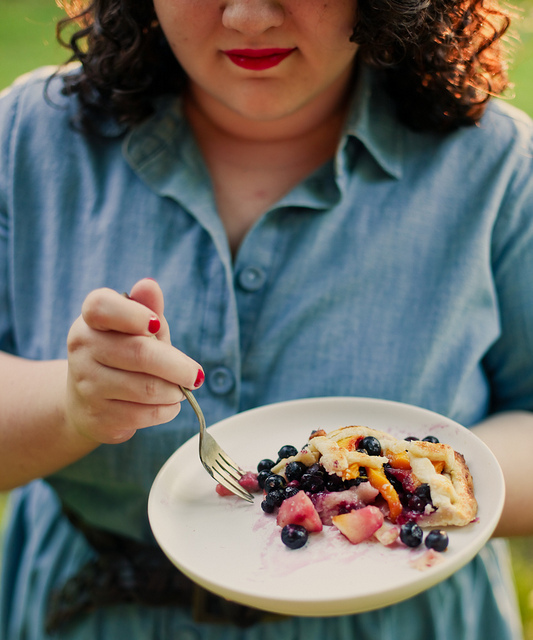 do you know i made a peach pie last year at (almost) this time and it was so memorable? don't you love when pies are like that? 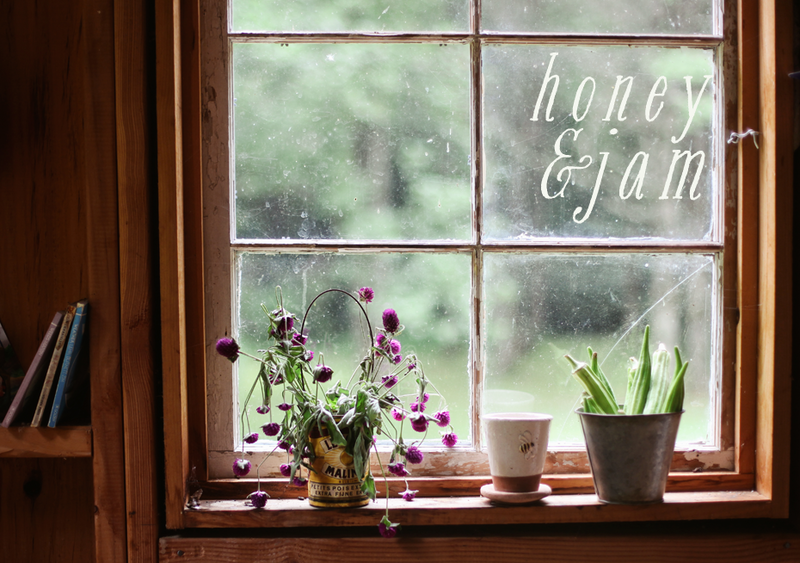 Hello there, I found your blog thru stampington magazine. Great story and recipe you have here. Glad to find yours! Lovely! I totally hear ya about the pie falling apart. Mine do that too! Especially the really juicy berry ones. This pie looks amazing and tasty, though! Lovely lattice! Delicious! Such gorgeous flavors and colors! so gorgeous, I love this combo of fruit. peaches and blueberries....summer is here! Sounds like the perfect pie for the summer... It looks lovely! This is the second peach and blueberry combo I have seen. Even one after the other. Looks like I'm missing out. I love pies. Especially cherry pies...but this I go do! Lovely photos as always. There is something so special about homemade pie! I love blueberry pie in the summer, and the addition of peaches sounds wonderful! Stunning looking pie! I don't make it as often as I should...thanks for the reminder. The world does need more pie! I missed the pie party but enjoyed all the recipes I saw around the food blogging world and I have now a pile of recipes to make :)) this looks awesome! This pie looks lovely! A perfect treat for the season! Will there be any more pie parties for the summer? Wish I had known about pie day, but I am sure loving all these recipes! This one is a real winner! Wow, your food photos are AMAZING! That pie looks delicious, as does all the rest of your creations :) Thanks for sharing! Hannah, this looks delicious. I have major problems with the pie falling apart, too. I also have major lattice-crust issues. I love the look but I always screw it up! Have you tried par-baking your crust with weights and cooking the filling? Sometimes fresh fruit is better, though! Yum! I want to try. Cook's Illustrated offers a great tip for naturally thickening the filling of pies (which keeps them from falling apart). They suggest adding a grated apple to the filling; apple has a high pectin content, which acts as a gelling agent and helps thicken the fruit. Using a neutrally-flavored apple, like Granny Smith, does this without imparting much flavor. Hope this helps! Just as stunning as this pie is your gorgeous dress! But really there's no denying the fact that this is one gorgeous dessert... those plump blueberries falling out. Don't let them get away!!! Funny you should mention peach blueberry pie. Delicious! I made this combination for the first time a few weeks ago while visiting a friend in Georgia. Check out my post at PortlandPeeps.blogspot.com dated Monday, June 27. As usual, I love your photos! 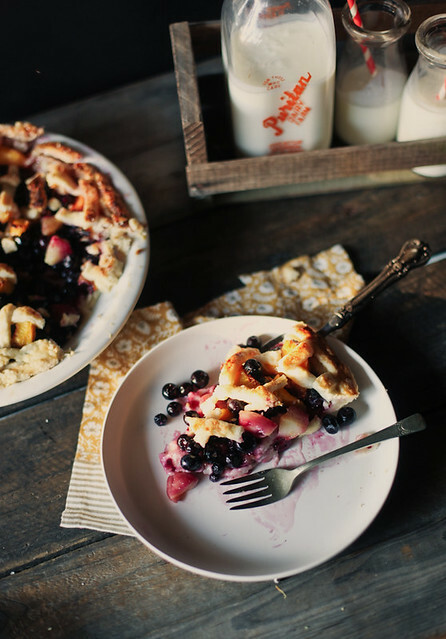 I love the rustic look of this pie and the combination of peaches and blueberries is just perfect! What a heavenly summer treat! Well, the falling apart is also a part of the 'home made' charm.. When made in big productions they add gelatin and other stuff to let it stick together.. And if you ask me, it still looks (very) delicious! Yum! Peaches and blueberries. Why didn't I think of that! Looks so good. If only my parents weren't on a diet, I'd make some pie! I made a peach-blueberry pie last year; looks like it's time to do it again! I can't think of a more quintessentially summer dessert. Also, it's a good sign when the fruit tumbles gracfeully from the slice-- it means the filling isn't loaded with gelatin or other stabilizers. I love your blog. Your photography is awesome. I've just spent hours trawling through your blog. Loved, loved, loved this recipe. My first time ever making pie and it was delicious. My neighbor, a fourth generation pie maker, said it was so good, she helped herself to seconds. I also made your no knead bread. Still some tweaking to be done, but my three year old LOVED it, especially with honey. I LOVE your blog. Its so inspiring and such a beautiful place to visit. It is a very taste food as far know.As it is being made with many amazing ingredients that makes it so alluring in looking.I wish i could eat this then. I think, it’s a helpful topic. I like this topic. I want know some helpful things from this side. It fresh my mind and experience. So lots of thanks for sharing this information with me. This pie looks absolutely gorgeous! I will have to try the crust recipe...homemade crusts still freak me out!!! I need to get over that, lol.